Tuna salad gets served up inside avocado halves in this simple recipe for two. 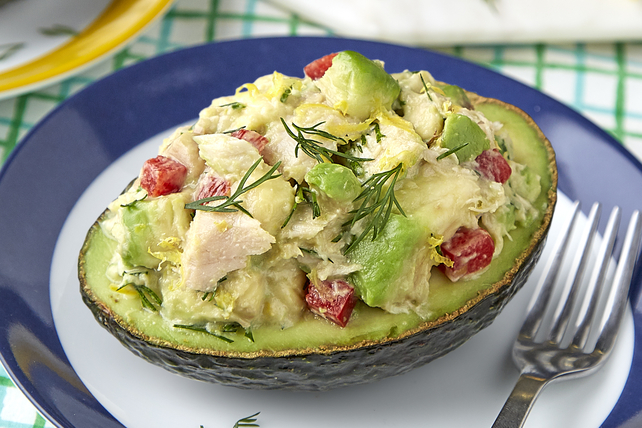 Chopped dill and lemon flavour this Tuna-Stuffed Avocado recipe - it's full of fresh flavour! Scoop out flesh from avocado halves. Reserve avocado peels for later use. Chop avocado flesh; place in medium bowl. Add remaining ingredients; mix lightly. Spoon into avocado peels. Cover filled avocado shells with plastic wrap before refrigerating. For added convenience, the filled avocado shells can be refrigerated up to 2 hours before serving.